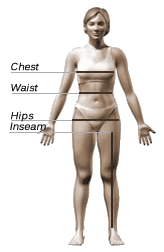 Take a snug measurement around your waist right above the hip bone. Step into garment like regular shorts and pull up. These stylish swim shorts have an inner pouch for comfort. The compression fabric is smooth and provide you with great support as well as UV protection with its SPF 50 rating.